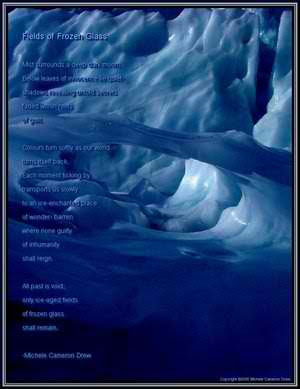 I really loved the images you used in this poem, especially the 'roots of guilt' and the 'ice-aged fields of frozen glass' which express perfectly and beautifully a whole universe of meanings. Have you ever thought of posting your poems on Literature Network Forums? They have a poem section which is very rich, with so many different types of poetry, and what's more: people take the time to read and comment. PS: I'm not the site's owner nor related to it; I just think your poems deserve the largest public possible! This picture is quite cool (no pun intended for real). I like the ray of light as if offering a ray of hope in the barren lands.